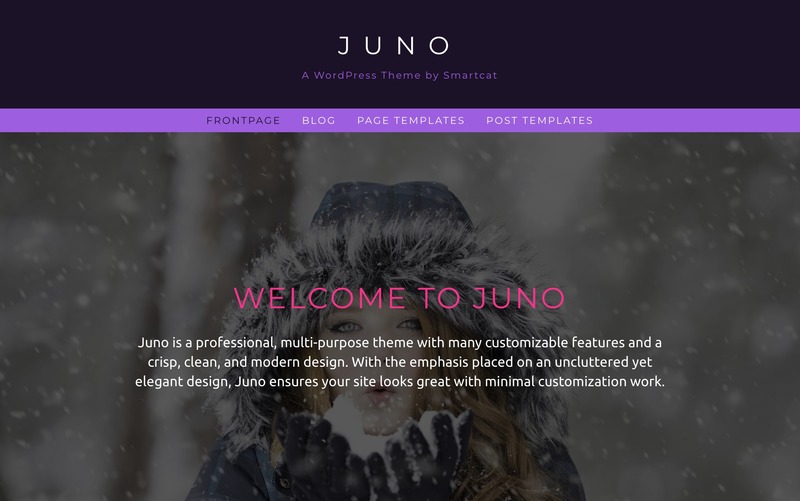 Juno is a professional, beautiful & multi-purpose theme with many customizable features and a crisp, clean, and modern design. With the emphasis placed on an uncluttered yet elegant design, Juno ensures your site looks great with minimal customization work. Juno is user friendly and easy to set up, and is equipped with custom features that will help you create a full website for your business, blog, personal site or portfolio. With modules like Testimonials, Clients, Projects, Events, Team and custom widgets such as Contact Form, Pricing Tables, Call-to-action, Contact Info, Juno is truly versatile. With Juno, you have unlimited control of the color options, simply choose from the easy-to-use color picker. Additionally it is equipped with many hand-picked fonts that are unique and appealing. We have also created a theme documentation, which you can use as a guide while you're setting up your website. Click here to read the theme documentation.